Owners wanted a more SUV-like design. Toyota listened. Toyota has unveiled its all-new, and compared to its immediate predecessor, it has a far more SUV-like appearance. But we’ll get back to that shortly. 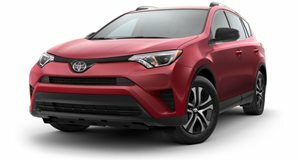 The main things you need to know about the 2019 RAV4 is that it rides on a new platform, specifically the automaker’s TNGA platform, it’s wheelbase is longer and there are wider front and rear tracks. However, overall length and height are slightly down. Toyota claims the new RAV4 is 57-percent more rigid than previously thanks in part to a multi-link rear suspension. Two powertrains are on offer: a 2.5-liter inline-four paired to an eight-speed automatic, or that same gasoline engine connected to a hybrid system that distributes power through a CVT. Front-wheel drive is standard while there’s a choice of three AWD systems. The new AWD tech is a torque vectoring system that sends 50 percent of engine torque to the rear wheels, and can also properly distribute that power to the left or right rear wheel for better handling. There’s also a rear driveline disconnect feature, meaning AWD is disabled when it’s not needed and power goes to the front wheels only for improved fuel efficiency. The other two AWD systems are both familiar: AWD-I on hybrid versions and the non-dynamic torque vectoring system on other gas-powered RAV4s. Toyota as further expanded the RAV4’s appeal with a variety of trims, such as the XSE Hybrid, which offers the sportiest driving dynamics of the bunch. It also comes with exterior piano-black accents and, as with all hybrid versions, projector-beam LED headlamps. There’s also an optional sport-tuned suspension with tauter shock absorbers and springs. Those who live an outdoor lifestyle will be drawn to the RAV4 Adventure. It comes standard with high-rise roof rails and large over-fenders. The exterior is more rugged overall, thanks to an aggressive grille, fog light surrounds, and unique wheel design. There’s also the RAV4 Limited, intended to appeal to those who enjoy creature comforts. Features here include 19-inch alloy wheels, chrome accents, 8-way power-adjustable driver’s seat with 2-way lumbar, a 7-inch multi-information display, and optional ventilated front seats and a panoramic roof. All 2019 RAV4s, however, are equipped with Toyota’s Entune 3.0 multimedia system encased in a 7-inch touchscreen (optional 8-inch) located atop the center stack. Both WiFi and Apple CarPlay are also standard. There’s also a new 11-speaker JBL audio system. Some standard safety includes a total of eight airbags, pre-collision warning with pedestrian detection, lane departure alert with steering assist, and the new lane tracing assist. As for the new exterior design, we dig it. It’s far more SUV-like than before, which is welcomed. The overall styling is directly influenced by some of Toyota’s most recent SUV concepts. The interior layout is also quite attractive and more premium than before. Pricing has not been announced, nor has an on-sale date, but we figure that’ll get underway next summer or early fall.